These and many other statements were made by Nobel Peace Prize winner U.S. President Barack Obama during his speech at West Point military academy. The ideas expressed are not new for the U.S. political establishment and its foreign policy, but do they fit the world we’re living in? And does the evaluation of the ongoing trends and events given in the speech correspond to reality? The West Point speech has revealed that the U.S. government and policymakers, as well as policy advisers have great problems with professionalism and competence. Obama’s placing of “girls kidnapped in Nigeria” and “masked men occupying a building in Ukraine” both in one line is a declaration of his achievement in isolating Russia on the world stage. Finally, U.S. propaganda has officially become avowed. Also, mentioning the menace of China’s economic rise and military reach casts doubt on the adequacy and professionalism of the president’s team and their analysis and valuations. It’s not far-sighted at all for the U.S. to spark tensions with China, which will overtake the U.S. this year as the world’s largest economy and bolster its alliance with Russia. This wishful thinking in declarations on Russia’s isolation is unallowable for any adequate leader who can soberly estimate the disposition of forces on the geopolitical playground. So Obama doesn’t seem to be on the case. The quality of work of State Department officials doesn’t seem encouraging either. And with all this, team Obama is still aiming to lead on the world stage? It’s naive. However it’s naive in general to seek global leadership in the modern world, especially having such a little success in the past. These years the world has become too complex to be managed using terms and categories of the past. The emerging BRICS markets, the rise of China and Russia politically and economically, the increased interdependencies between the players all over the world, as well as a relative but steady return of realpolitik and national interests should warn any global player against seeking the hegemony and obtrusion of its own will. Efforts to shape desired opinion in the global community through traditional media, in other words to make the propaganda machine work, are dubious as well, taking into account free access to information all over the world through internet and social networks. Obama’s stance on the importance of allies is laudable. But the problem is that allies can be lost. Assertive recommendations from the U.S. to the EU to introduce new sanctions against Russia, or requests to cut down the consumption of Russian gas, and practically the governance of the European Union though telephone calls, consultations and meetings lead to deep concerns. And all this is apparently with no understanding of the deepest independences between the EU and Russia, as well as of the harm deeper confrontation with Russia can cause to America’s European allies. Such approaches on harming Russia do not remain acceptable, neither by European business circles nor by ordinary people. To what can it bring in the visible future? Just look at the results of the recent European elections and the results of each country, especially the one with a combination of economic, historical and cultural ties with Russia, more than any other Western European country; France. Marine le Pen is the only French leader that promises to withdraw France from NATO, to guarantee the country’s independent internal and external policy. Populist or not, the recent trends show that the French people want this more and more. The current president seems to be a shadow of the U.S. with regards to his foreign policy. The more the U.S. will try to preserve its dominance the more it will lose it, especially with those who are sitting now both in the White House and in the State Department. 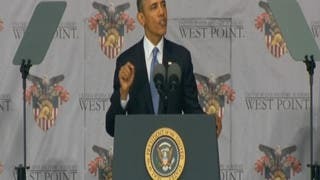 The West Point 2014 message to defend foreign policy, both from “hawkish” parts of the political establishment, partisans of interventionism, and “dovish” parts, partisans of relative isolationism (as they equally criticize Obama who is right in the middle of these two extremes) can be considered as a failure as well as practically the whole Obama’s foreign policy. So after being a "hawkish dove" or a "dovish hawk" for trying to defend his foreign policy, he has finally predetermined himself as a limping duck for the remainder of his presidency.